Is India moving on a path towards segregating society, enclaving economic space in a way that essentially excludes the majority from the development orbit? Is India moving on a path towards segregating society, enclaving economic space in a way that essentially excludes the majority from the development orbit? A large number of Indians from various cross-sections are currently enraged about this crucial question. While official outlets make frantic efforts to project this tendency as a contradiction between modernity and backwardness and label anyone questioning the validity of the above development model as ‘anti-development’ or ‘unlawful’, innumerable lived experiences go on reflecting heightening inequalities and the increasing expendability of the poor. Take the case of the resource-rich tribal heartland of Jharkhand, Orissa, Chattisgarh and Madhya Pradesh located in central and eastern India. 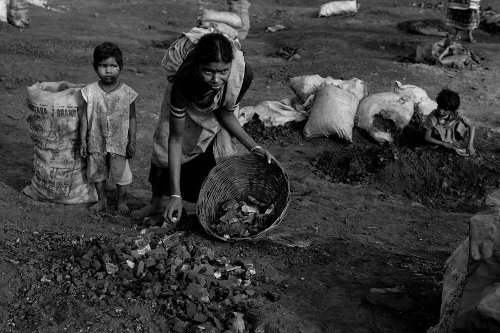 Mining areas in these states are enthusiastically being leased out to global corporations leaving the poor tribal community homeless; common lands and waste lands in several states that have been traditionally providing livelihood and survival means to the poor are being taken over to make Special Economic Zones; rich coastal areas with enormous bio-diversity are being handed over to corporations like Dow Chemicals for making chemical hubs; natural resources like rivers are being privatised for industrial and commercial purposes, like the Sheonath river in Chattisgarh. Examples abound. This ‘development’ process that rests heavily on displacement, dispossession and destruction of the environment is creating an irreversible production structure in favour of the rich that is actively supported by all major international financial institutions like the World Bank, International Monetary Fund, Asian Development Bank and the like and facilitated by the neoliberal Indian state. 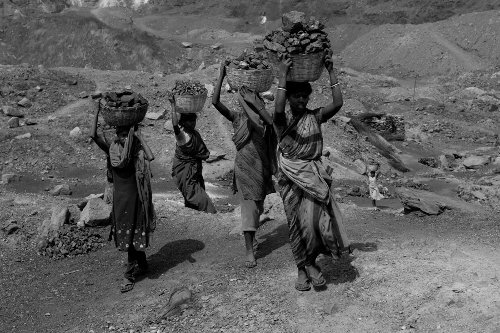 Jharia coalfield in Jharkhand. Demotix / Poul Madsen. All rights reserved. Specific areas in India – large and small, rural and urban - are being identified as global economic regions to carry out modern hi-tech corporatised activities. Essentially global, these new economic spaces (location choices are made by investing corporations) are carved out from existing agricultural areas, forest lands, mining areas, fishing zones, peripheries of metropolitan regions, villages, even slums and dilapidated areas inside cities. In the process of converting these spaces into newer ones, large numbers of farmers, agricultural labourers, fishermen, in short a huge section of economically active but poor people are being displaced and dispossessed leading to fierce resistance struggles, inviting in response, state atrocities and violence. The phenomenon has become pan-Indian: whether in Raigad in Maharashtra, Singur and Nandigram in West Bengal, in Jagatsinghapur-Kalinganagar in Orissa or Ghaziabad in Uttar Pradesh, the patterns are comparable. The official argument says that as the State is not financially capable of providing ‘world class infrastructure’ in a short time, it is necessary to invite private capital to provide it initially in chosen pockets that will boost economic growth in the surrounding regions. While private capital undertakes this task, it becomes obligatory on the part of the State to offer them concessions and subsidies, in exchange. Land acquisition for such global spaces is undertaken by invoking a Colonial Act of 1894 that says that the State is the ultimate owner of land and can take over any tract for ‘public purposes’ by paying reasonable (sic) compensation. Enclave development, once a mainstay of the colonial state, has made a glorious come back in contemporary Indian economic policy. This newer form of capitalist development depends on global finance and technology and a supportive neoliberal hegemonic discourse. It goes beyond the previous practice of disaggregation and production relocation in areas with lower social reproduction costs to an altogether newer design of total appropriation of space for a novel exploitation process. Set to mutate all existing social relations, it further modifies the non-Fordist labour process, transforms relations between the dominant and the dominated and alienates space-economies from their respective social realities to construct an economic system conforming to its description in pure theory. The common collective interest and the public good start getting negotiated away by ideological, political and economic power-plays that privilege individual accumulation, subordinating the common people and their rights in a way that is even used to underpin justifications for state violence. Resting on a contradictory framework of inclusion (of the few) and exclusion (of the many) it materialises a multiscalar, uneven development involving integration of selective regions and sections of societies in a globalised market framework. A destructive ensemble of obsoletism and reconstruction diffuses across the old spaces, displacing the existing use values and altering the discursive as well as the material geography of such spaces, creating a solid, material background for intense conflicts. A typical neoliberal construction of space, place and scale is taking place in India that is reconstructing a new geography of centrality and marginality, making the issues of production and capitalisation of space extremely crucial. The resultant landscapes of conflict invite resistance and contestation from below by those whose livelihoods get jeopardised and who are systematically marginalised by the state apparatus in diverse ways that expose their vulnerability in the current order. To identify the causal factors, one needs to look at the direction of India’s current economic momentum. There has been a far-reaching shift in her economic policy, facilitating ingress of global capital in all economic sectors, downsizing labour, outsourcing economic activities, and promoting an aggressive urbanism based on gentrification and privatisation. Based on exploitation of the product of labour, pillage of nature and expropriation of social property, such policies have a close connection with international financial institutions, the global corporate sector, and quite significantly, the major capitalist countries. The State, backtracking from its previous role of a provider takes a neoliberal stance, becoming a vociferous facilitator of private capital pitching heavily on a ‘politically neutral’ practice of developmental governmentality. While the country’s growth roars ahead at an annual 8 per cent, growth in regular employment in recent years is found to have exceeded not even 1 per cent. Quite logically India accounts for the largest number of homeless, illiterate and ill-fed people in the world. Amidst the euphoria of creating a free market, in practice the contemporary policies are resulting in a dramatic intensification of a coercive disciplinary form of state intervention to impose a market rule that subjugates the majority and protects the ‘strong’. This is taking place on an aggressively contested institutional landscape in which newly emerging ‘economic spaces’ stand in conflict with inherited regulatory arrangements, providing a political arena through which subsequent struggles over accumulation by dispossession and its associated contradictions are getting articulated and fought out at various scales questioning the prevailing development path of the country, assuming a national character, often supported by pan-Indian coalitions of regional resistance groups, broadly/basically left oriented but not belonging to mainstream left parties. The resultant negotiating strategy of the neoliberal state creating multi-level contradictory spaces of conciliation, coercion and atrocity is significant in exposing the porosity of the state apparatus. One needs to emphasise that the contextual embeddedness of the current exclusionist economic policy in India, produced at national, regional and local scales, are not only getting defined by the nexus of policy regimes, disciplinary political authorities and their regulatory practices, but also by resistance struggles, consolidated grassroots movements and mobilisation of progressive forces that are challenging the state sponsored corporatised development paradigm. Peripatetic global capital in collision with state power may exhibit its authority in controlling spaces and territories for some time, but the ongoing struggles clearly point at an emerging discourse in search of an alternate paradigm, based on a democratically oriented sustainable development practice. Banerjee-Guha, Swapna (1997). Spatial Dynamics of International Capital, Orient Longman, Hyderabad. Banerjee-Guha, Swapna (2002). 'Critical Geographical Praxis: Globalisation and Socio-Spatial Disorder', Economic and Political Weekly, Vol.37 (44 & 45), pp. 4503-09, Mumbai. Bhaduri, A (2008): 'Predatory Growth', Economic and Political Weekly, Vol.43(16), pp.10-13, Mumbai. Bourdieu, P (1998): 'The Essence of Neoliberalism', Le Monde Diplomatique, December 1998. Conway, D and N Heynen (2006): 'The Ascendancy of Neoliberalism and Emergence of Contemporary Globalisation' in Denis Conway and Nik Heynen, (eds. )., Globalisation's Contradictions, Routledge, U.K.
Cox, H (1999): 'The Market as God: Living in the New Dispensation',Atlantic Monthly, March, pp.18-23. Gill, S (1995): ‘Globalisation, Market Civilisation and Disciplinary Neoliberalism’, Millennium, Vol. 24, pp 399-423. Sanyal, Kalyan (2007): Rethinking Capitalist Development: Primitive Accumulation, Governmentality and Post-Colonial Capitalism, Routledge, New Delhi.